Close to a couple pubs and restaurants. We were on the top floor so the mountain view was awesome to wake up to! Excellent location and service. Restaurant is next door. It was a cool facility. Super cheap but super clean. 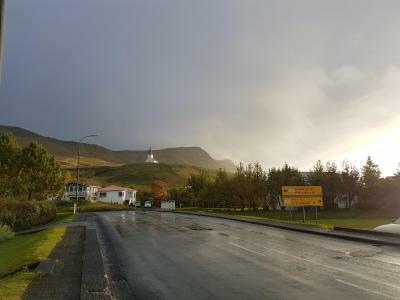 located near vik beach (15 min by car). Kitchen is provided. 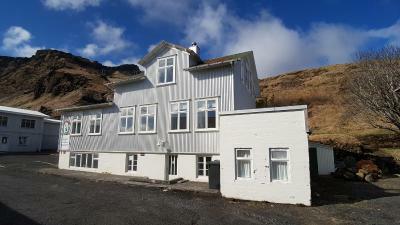 Located in Vík town center, this historic century-old hostel is a 10 minutes’ walk from Vík’s famous black beach. Guests have access to a communal, well-equipped kitchen and shared seating area. Kötlusetur Museum is located next door to the hostel. 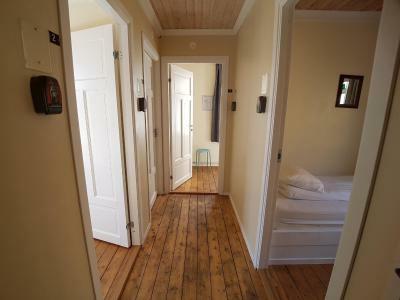 Each room at Puffin Hostel Vík is simply decorated and has shared bathroom facilities. Jeep tours around the surrounding mountains can be arranged. 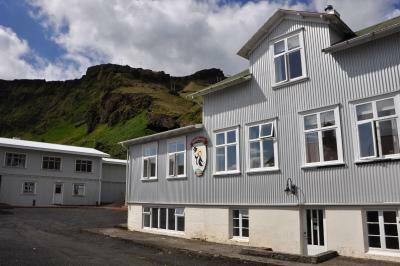 A public indoor swimming pool and horse riding activities at Vík Horse Adventureis a both 10-minute walk from Puffin Hostel Vík. 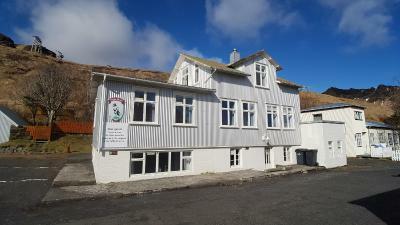 When would you like to stay at Puffin Hostel Vík? Please note that this room has a bunk bed with a bottom double bed and a top single bed. This compact room is 5 square yards. Please note that the bed is 71 in long. Built from timber and clad in a corrugated metal exterior, the hostel opened in 1913 and has been preservd in its original state ever since. 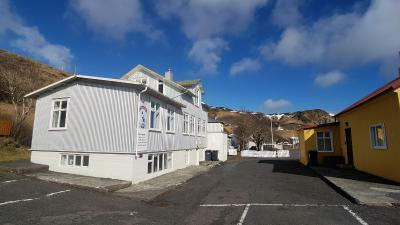 It was designed for traveller accomodation, which makes it the longest-running hotel/hostel in Iceland. In this respect, we would like to remind our guests that this house is over 100 years old, which means the interior is old as well, with creaking floors and narrow staircases. Nevertheless, we are certain modern-day travellers will enjoy the charm of this historical building. 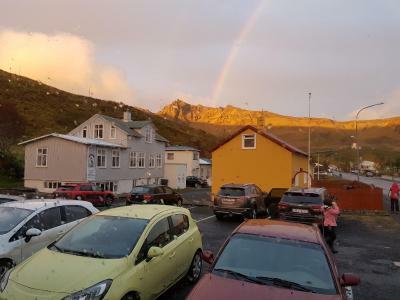 House Rules Puffin Hostel Vík takes special requests – add in the next step! Puffin Hostel Vík accepts these cards and reserves the right to temporarily hold an amount prior to arrival. Please note that the property is located on 3 floors and does not have a elevator. 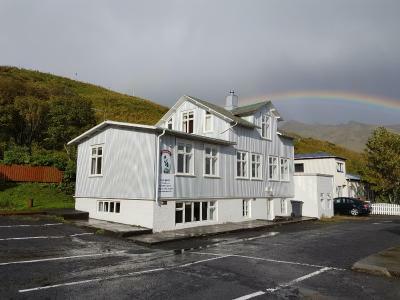 Please note that check-in and key collection take place at: Puffin Hotel Vík, Vikurbraut 26, Vik 870. Not really a hostel, not really a hotel. Common areas not that inviting. For a quick stop one-nighter has everything needed. The rooms were pretty small and not really sound proof. Great location for an affordable price! Didn`t enjoy walking on the stairs (inside the hostel) without shoes (the hostel has a rule saying: Guests are not allowed to use their shoes inside the hostel when walking between the shared bathroom and the room. I found this quite strange but they told me it`s a common practice in Iceland. Basic accommodation but clean and tidy. We have received good information from the receptionist about the things to do. The walls are a bit thin, loud was coming upstairs from the kitchen. Nice little hostel with a friendly athmosphere. We really enjoyed staying there. Parking was convenient and the bathrooms are really clean and spacious. - Very small rooms. Paper walls. - no where to hang you stuff, no nightstand nor lamp - smallest common Toilet and questionable hygiene. - common rooms are old and dirty. We were happy to have been there only for 7.hours. We will never come back. IT'S A DISGRACE to pay so much money for so few customer service and orientation. The customer is the cash cow while the furniture becomes rotten. The common room was not comfortable at all. The furniture quite run down. The room was tiny and the bed squeaked a lot with the smallest of movement. The room we stayed was very tiny. That's ok if you are just going to sleep. But except from that there's no space for anything else. It was a bit expensive for what it was, but in an area where there aren't that many places to stay so accommodation is in higher demand I suppose that makes sense. 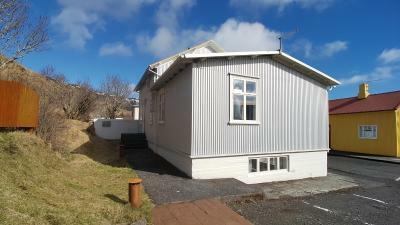 Loved this hostel - Vik is a really lovely little town, great for exploring the south coast of Iceland. The hostel itself was basic but had all the facilities we needed and was really cosy and homey. The kitchen has all the supplies you could want and there's a large common area to eat/hang out in. The housekeepers were not really nice. The guy at the front desk that night, really helpful. A very nice hostel with a friendly and helpful staff. This was our second stay and would definitely recommend.